Self-Care: Do you know what works for you? This is an important question to ponder if you aren’t sure. We know our time is precious and is equally as valuable as our money. 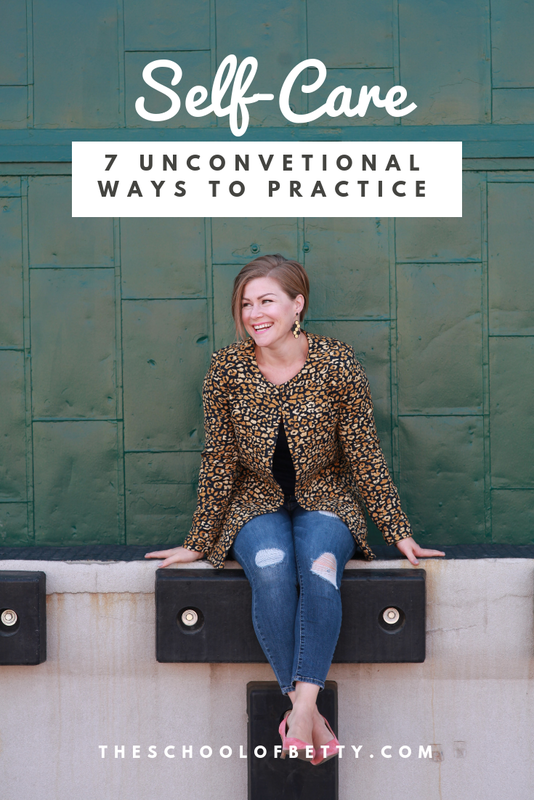 If we willy nilly start doing things as “self-care” but we really have no idea if they actually work for us, then my friend...you’re wasting time AND energy (oh geez...I wasn’t expecting to throw down a truth sprinkle just yet!). Self-care is a trendy topic these days, and that’s okay. I’d rather it be trendy than taboo because it can make an incredible positive impact on your life and your mental health and here’s the thing...it does not have to be all spas and pedicures. We practice self-care because we want to be the best versions of ourselves and in most cases, we want to eliminate stress and avoid feeling depressed and overwhelmed. Frankly, I think what is missing from the “self-care” talk is that it should be used as a prevention method. A way to show yourself grace and gratitude DAILY and not just in times of pure burnout or breakdown. Because each of us experiences those feelings differently (and I mean, completely unique to us), it is incredibly important that we find self-care actions that work for us. #1. I make time to be quiet. This doesn’t necessarily mean meditation or sitting by a river pondering life (although that sounds nice). For me, I mean...simple quiet. Driving to work without a podcast or the radio on. Walking the dog without earbuds on. Cooking dinner without music or a podcast. Taking a nap without the TV on. Quiet to me feels calming and this is a go to when I am feeling a bit unfocused or cranky. BONUS...it’s free yo! And yes, I do meditate 3-7 days a week. #2. I organize my week. WELL BRI...THAT...sounds boring. I know right!? Listen, clutter breeds chaos both in the mental and the physical sense. I find that when I know what the week will look like and have reviewed the days, I KNOW how much time and effort I might need for self-care. Example, this week: I am not saying yes to things outside of working out. If I keep running on fumes, I’ll eventually crash and bouncing back from that (for me) is a looooong process. Looking at my week helps me assess where I am spending my money, time and energy. #3. I keep a “beach” book on my Kindle. For the most part, I read mostly nonfiction books because I LOVE, LOVE, LOVE absorbing information, especially if it can help a student, a follower or me! But sometimes, it doesn’t allow my brain to relax. So now, I keep something light and fun on my Kindle and I make it a point to read it a few times a week. It might only be 3 minutes before I go to bed, but I’m reading it. CURRENTLY I'M READING: Book 2 in the Confessions of a Shopaholic series. That Sophie Kinsella knows how to write a fluffy book and I.LOVE.IT. #4. I choose a Starbucks day. Ya’ll know I love coffee! Most of the time, I take my coffee to work or have it at work, but I still enjoy that drip coffee from Starbucks (totally in my head). So instead of choosing Starbucks during the week when my emotions are trying to run the show, I choose a day when I’m planning out my week. Maybe I have an early morning meeting or I have a big report to write and a coffee is just the mental boost I need. The point is that it is pre-planned and therefore not driven by emotion. #5. I write in my journal every.single.day. Some days it might be one sentence and other days it might be 5 pages (okay, well...that’s aggressive...2 pages) but I still do it. And I don’t think of it as a HAVE to, I think of it as time for me to download my thoughts. I feel most grounded when I do this because it allows me to have space in other areas of my life. My brain isn’t buzzing around 100 mph all day because I’ve already dumped it into the pages of my journal. #6. I paint my nails on Sunday night. At first I started doing this because we don’t have $10 manicures here in Denver like they have in NYC (Le sigh) and so, I was approaching it all wrong. Now, there is something calming about taking the time to take care of my hands and feet that feels so simple and so special. Basically, showing my body care. HOLD UP...that doesn’t sound fun. Well, like everything, it is all in the framing. For me, I know if I meal prep, I’ll stick to my food budget AND my body feels better AND, I already know what I’m cooking each night so that allows me more time to sit on the deck, take an extra long walk or...I don’t know...go ham and put another top coat on my nails. Staying organized and managing my time are two of the biggest drivers of my self-care routine. When we take time to do those things, we gain so much more in return. What do you do for yourself? Reply to this email, I’d love to know! Pick one thing to do for yourself this week my friend and put it on the calendar! P.S. Last week in The Financial Diet, I wrote about keeping my closet organized. You can read about it here.